So last week I posted Things Vet Techs Don’t Like and hopefully enlightened the world a bit about the the daily aggravation that comes along beside the daily satisfactions Veterinay Professionals have. It was a short list, and definately not the end. Behold! My Dog Has A Tiny Boo Boo, KILL IT! Umm, My Appointment was for 3:30, its 3:32 Why Haven’t I Been Seen? What Do You Mean The Vet Is A Human Being That Requires food? This client baffles me. Truly does. Evey single job that offers full time employment also offers lunch breaks. Whether it’s service industry, retail, medical, anything that is legal you get a lunch break. HUMANS NEED FOOD. 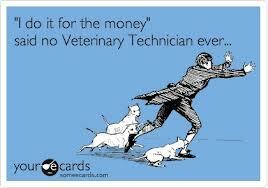 So as per human requirement for life Veterinarians take lunch breaks. Some hospitals even close down for the lunch hours. Some are just opened for over the counter sales. That should be something quite easy to understand since we are human. Yet, some clients come in at these times and demand to be seen by the doctor because little Fluffy has been having diarrhea for 7 days. But today at lunch it’s imperative they be seen. Then they get extremely upset that your human doctor is out obtaining sustenance. For shame on the good doctor for the need to eat and function normally. I love this client. They come in when it’s at their leisure and randomly request their medication for their pet be refilled. Most clinics have a Refill policy, you most likely need to call in advance. When this client is told this for the millionth time they instantly grow upset and say they were never told this. It doesn’t help their case now that they are being rude about it, and you have a posted sign about this policy. Now they are passed saying you want their pet to die, and we are evil, yet it’s their own personal responsibility to follow policy. Sigh… life is just peachy when you have clients who don’t see how they are at fault.